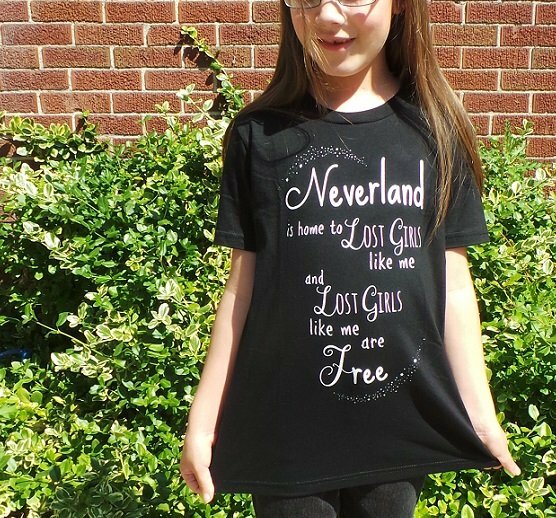 I made my daughter her own special t-shirt, based off of the lyrics from Ruth B.’s “Lost Boy” song. Back in June Gracie came home from school singing a new song she’d picked up off other kids on the playground. She told me it was her new favourite song ever. She sang part of it to me and I had to admit I’d never heard it before. “I am a lost boy from Neverland. Usually hanging out with Peter Pan.” Hunh. Well that could be a made up kid’s song, or some nursery rhyme or skipping song I’ve never heard, or it could be from some kid’s movie I’ve never seen… She asked me if I could look it up online, and a little bit later we sat and watched Ruth B. sing “Lost Boy”. My daughter blushed and looked down at the floor as she confided in me that sometimes, well most times, she likes to sing lost girl instead of boy. I told her that was perfectly cool, and that I was certain there were lost girls running around in Neverland. Heck, I never wanted to be Wendy Darling either. Who wants to mend a bunch of little boys trousers, tell them stories and give them their medicine, when you could be running and playing in the woods? I had an idea to make Grace something special for her 9th birthday. 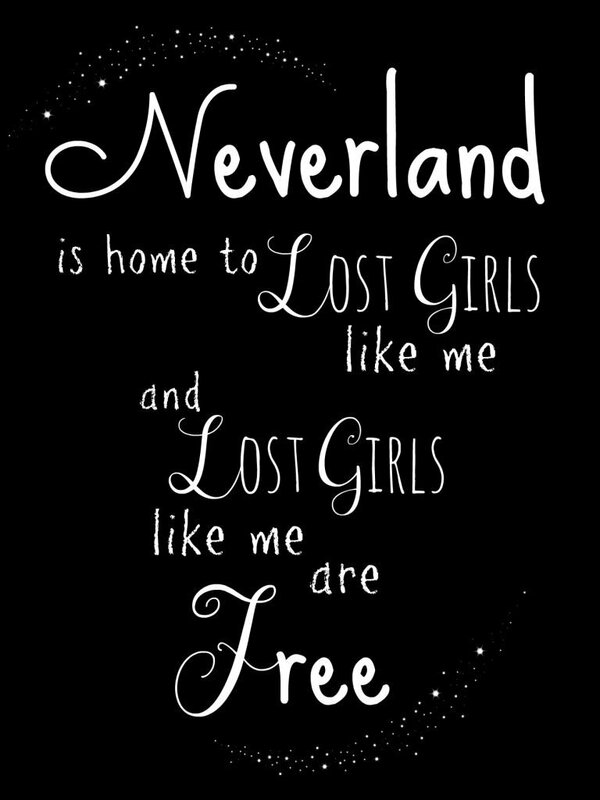 So I made up a design that read “Neverland is home to Lost Girls like me, and Lost Girls like me are free”, and then I searched around online for a place to get it printed. One that would ship from within Canada, and get here in time for my girl’s birthday. I ended up going with Wordans.com. Getting just one shirt printed up cost me a small fortune, but it was worth every penny. When my daughter laid eyes on that shirt her eyes lit up and she glowed from tip to toe. Who needs pixie dust anyways? I wanted to share the design with you all, but I needed to ask my girl’s permission first. My daughter was pretty impressed with the fact that mom made her her own shirt, and that it was the only one in the whole wide world. However she told me she thought it would be pretty awesome if I shared it online, and she liked the idea that maybe somebody else out there would be wearing it. So here it is, in case you happen to know a wild little Lost Girl or two of your own. What a great idea! The shirt may have cost a small fortune but that smile is priceless. Thank you, Rainbow, for sharing your gift with us. oh, I love that song! everytime i hear it on the radio I sing along. and how wonderful, that now your daughter has a totally custom shirt. yeah, it was a little expensive, but wow, what a great gift! I LOVE the shirt you designed for your daughter! It is beautiful and very special since you created it just for your little “Lost Girl”. Since the idea came from a song about lost boys, I wanted to tell you that there actually are songs about lost girls! There is an incredibility brilliant songwriter named S J Tucker who has written a trilogy about what would happen if Wendy, when asked to join Hook’s crew said YES! I will try to leave you a link for the first song of the three.